Looking for more effective ways to face change at work and in your life? Want to help your team be more creative when the stakes are high and time is tight? 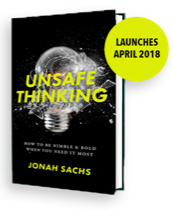 This five-minute quiz will reveal what you can do more of and what you should stop doing when it comes to breaking out of the safe thinking habits that most commonly hold us back. 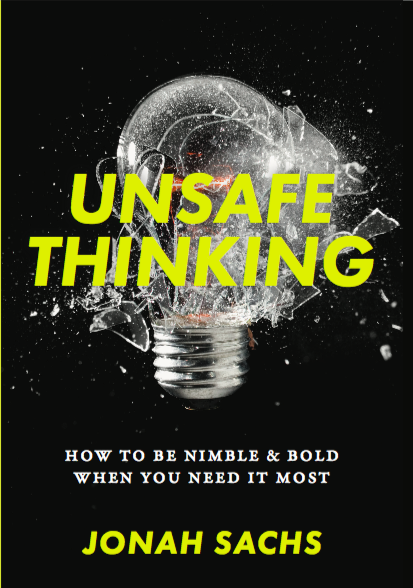 Unsafe Thinking: How to be Nimble and Bold When You Need it Most. YOUR RESULTS: Here you’ll find the three most important mindsets that allow people to react boldly and creatively in the face of change. Based on your answers, you’ll also see how regularly you employ each mindset. Self-identified “experts” like to dwell on what they know. Explorers often have just as much knowledge but they are driven more by curiosity about what they don’t yet know. Those with an Explorer’s Mindset learn more quickly because they have less ego-attachment to a position they took yesterday. They deliberately practice the things at which they’re weakest, which is the fastest path to improvement. And they are predisposed to seeing change as a chance to experience something new rather than as a threat to their tried and true ways of operating. Those with a Scientific Mindset are always thinking critically about their own thinking. To be human is to have a host of automatic thoughts and biases — we can’t help it. But the scientific mindset helps us to understand these biases and recognize when they’re trapping us. People with a Scientific Mindset trust their intuition but also constantly test to see if its signals are authentic or just prejudice in disguise. Those with a scientific mindset instinctively seek out information that might prove their thinking wrong. Thus scientific thinkers are slower to form an opinion but less often get locked in mistaken thinking. People with a Courageous Mindset think counterintuitively about threats and challenges. Instead of seeing anxiety as something to be avoided, a Courageous Mindset allows them to see fear as a sign they’re on their creative edge. Rather than seeing conflict as a threat, the see the generative power of disagreement and engaging with people who view the world very differently. And instead of seeing rules as ironclad restrictions to always be followed, the Courageous Mindset allows one to engage in “intelligent disobedience” from which breakthroughs so often emerge. Want to improve your ability to change yourself in order to change your world?Just hit the button below and I’ll send you the top 3 things you can do to boost each of the three mindsets. Through stories and science I explore the techniques that allow individuals and teams to thrive in times of change.